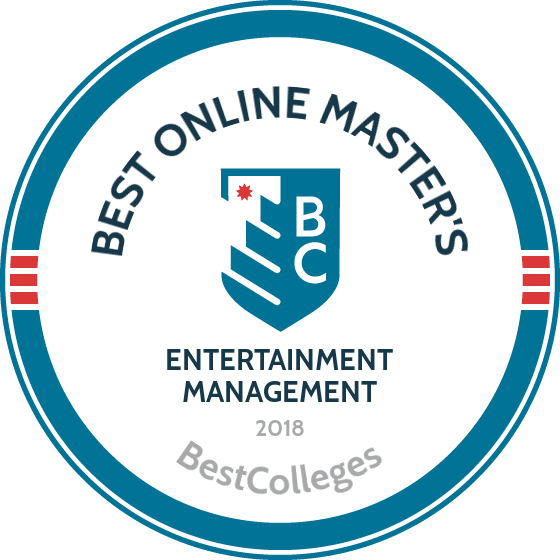 WHAT ARE THE BEST ONLINE MASTER'S IN ENTERTAINMENT MANAGEMENT PROGRAMS? In the entertainment industry, famous actors, musicians, and athletes garner the limelight. Behind the scenes, however, entertainment managers work hard on behalf of their clients, and help them make the best decisions to further their careers. In addition to working with some of the biggest names in entertainment, skilled entertainment managers can earn upwards of $194,000/year. According to the Bureau of Labor and Statistics, the number of jobs in the entertainment industry grew approximately 10% since 2007. The need for skilled, well-educated entertainment managers has never been higher. The salary potential, in combination with the entertainment industry's rapid growth, make an online master's in entertainment management an attractive option for those looking to take their careers to the next level. The University of Miami's Frost School of Music offers an online master's in entertainment management that gives students a real-world understanding of live music promotion. The 30-credit degree can be completed in 18 months and imparts relevant skills in music publishing and licensing. UM's approach is unique in that it blends promotional and management philosophies with legal aspects of the live entertainment industry. The program is taught by faculty with experience in the music business, and upon graduating, students gain access to an extensive alumni network. While enrolled, students can take classes in areas such as music copyright law, arts leadership, and tour management and production. Each student must also complete a cumulative exit exam. Students with three or more years of music experience can qualify for a Life Achievement Scholarship, which reduces their online tuition by 15%. Drexel's online master's in entertainment management focuses on arts administration and the television industry and is intended for individuals who are passionate about content creation and delivery. The program offers two online degree options: the MS in television management and the MS in arts administration. The 49-credit television management program can be awarded as a combined MS/MBA degree, and prepares students for careers at large television companies. The 45-credit arts administration program trains students in the business management aspects of the arts industry. Applicants to both programs must have earned a bachelor's degree from a regionally accredited institution with a minimum 3.0 GPA. Work experience is preferred for the TV management program, while coursework in arts and accounting is preferred for the arts administration program. The arts administration degree begins with a brief on-campus residency before delving into asynchronous coursework. The New School's master of entertainment industry management online program teaches students to be responsible and innovative leaders in multiple areas of media management. The wide-ranging curriculum includes studies in almost every aspect of modern media development, including production, finance, and distribution. As a result of studying with top practitioners and executives in the field, students are prepared for careers in TV, movies, music, advertising, gaming, and social media. The 36-credit curriculum includes a three-credit capstone/thesis project. Interesting courses include a radio lab, digital strategy, and media economics. Students are welcome to take courses on a part- or full-time basis. Applicants may seek entry in the fall or spring semesters, and must submit an 8-12 page writing sample to be considered for admission. Colorado State's master of communications and media management (MCMM) program is intended for experienced professionals who want to advance to leadership roles in the field of communication. The program is taught in a hybrid format, with students attending face-to-face classes once a week and taking additional elective courses entirely online. The focus of the online master's in entertainment management is the strategic use of media, and coursework includes studies in advertising, the history of media, and media ethics and issues. The MCMM operates on a cohort model, with students completing one in-person course and one synchronous online course per semester. The program consists of six semesters completed over the course of two years. Students may apply for admission in the fall, spring, or summer semesters. All students must have earned at least a 3.0 undergraduate GPA. SNHU partners with the world-renowned Berklee College of Music to deliver its online MBA in music business program. Compared to other online MBA in entertainment management offerings, SNHU's program is much more focused on production, distribution, and new technology in the music industry. The 13-course degree consists of classes in music marketing strategies and music business finance, along with nine MBA courses in areas such as economics and business law. Since music and business are inextricable, the program teaches students to apply best business practices in order to succeed in the industry. Graduates of the program can find work as music publishers, tour managers, music distributors, and copyright managers. Students can finish the program in as few as 15 months. Courses are delivered asynchronously, with students taking two courses during each 10-week term. Business is the foundation of entertainment management, as entertainment managers negotiate contracts and help their clients with financial planning. Additionally, an online master's in entertainment management program offers coursework in entertainment law, marketing, and publishing to further broaden one's skillbase. The courses below represent some you may take during your program. However, each university is different, and may offer different coursework or graduation requirements. Be sure to check with your school(s) of interest for more information. Project and Team Management: Students in this course learn how to plan all aspects of a large project and manage team members. The course emphasizes staying within budget and assessing team members' strengths and weaknesses. Entertainment Business Finance: Helping clients make sound financial decisions is a large part of entertainment management. In this course, students gain core business knowledge that helps them best serve their clients. At some universities, this course may detail how to fundraise for an individual client or start-up. Negotiation and Deal-Making: Growing a company or brand requires business savvy. Students studying negotiation and deal-making learn how to turn an individual client or company into a money-making brand. The course also covers contracts and persuasion. Business Plan Development: Most universities that offer a master of entertainment industry management online have a capstone experience for students to synthesize their business knowledge. In some cases, students create a business plan throughout the quarter and present the final product. Digital Marketing: Digital marketing contributes to the success of every entertainment manager. In this course, students learn digital marketing best practices so students can sell themselves to potential clients, and also use those practices to the advantage of their clients. How Long Does it Take to get an Online Master's in Entertainment Management? Students studying full-time can earn their online master's in entertainment management in approximately 12 months. Some universities require additional courses, which lengthens the time required to earn a degree. In many programs, students take courses at their own pace; these students may elect to study part-time, and therefore take 18 months to two years to complete their degree. In a typical program, students earn approximately 40 credits. Some universities also offer a cohort program, in which a small group of students journeys through the program at the same pace. This learning method encourages interpersonal relationships and teamwork, two essential skills that entertainment managers need to serve their clients well. Cohort programs also provide students the chance to network -- an invaluable skill in the entertainment field. Accreditation agencies oversee a university's academic programs to ensure they provide a high-quality education. There are three main types of accreditation agencies: The first and most prestigious is regional accreditation agencies. Six agencies, monitored by the Department of Education (ED), review academic programs in different regions across the U.S. National accreditation is the second type, and these agencies oversee specialized programs such as vocational and trade schools. Finally, there are program-specific accreditations, which certify a particular program within a school. In addition to the ED, the Council for Higher Education Accreditation (CHEA) set accreditation standards for academic excellence. When researching your master's in entertainment and management programs, it is important to consider what kind of accreditation your prospective school offers. This will ensure you receive a high-quality education. To learn more about accreditation, please visit the Department of Education or CHEA websites. A master's in entertainment management can be preparation for a variety of careers. The program's broad education in finance, contract negotiation, and leadership provide graduates a great deal of flexibility. Most jobs accepted are full-time and some require travel. The positions below are a sample of jobs held by graduates. Managers work closely with other company managers to write contracts, research market opportunities, and plan advertising campaigns. A master's in entertainment management gives graduates an advantage both in hiring and promotion. Advertising sales agents locate potential clients that could benefit from advertising services. Besides cold-calling, advertising sales agents maintain current business partnerships through meetings and presentations. With a master's in entertainment management, graduates have strong interpersonal skills necessary to attract new clients. Analysts research market trends and conditions to determine whether their company's service or product can make an impact. Besides research, market research analysts perform surveys and make presentations to company management. A master's in entertainment management is terrific preparation, as most programs offer in-depth instruction in marketing and research. These specialists maintain their company's public image. Their duties vary greatly depending on their company's needs. A public relations specialist handles a company's social media accounts, interacts with the public, and writes speeches. Sales managers oversee teams of sales agents, and analyze their team's performance to make informed decisions that benefit the company. Other duties include mentoring sales agents, making recommendations to management, and resolving disputes with clients. A master's in entertainment management, along with solid performance as a sales agent, means that graduates can rise to this position rapidly. While an online master's in education management prepares you for many different careers, these median salary projections reflect only a handful of jobs. Two trends emerge within this data: overall, jobs in this career field pay at or above the U.S. median salary for master's degree holders; and, salaries in this career field grow approximately 50% over your career. With a master's degree, you can generally expect a higher starting salary. Applying for financial aid begins with completing the Free Application for Federal Student Aid (FAFSA). The FAFSA determines your eligibility to receive federal loans and grants to further your education, while universities offer need-based and merit-based scholarships. There are also many business management scholarships for which you may be eligible to apply. For example, the A&F Business Consultants Scholarships awards up to $1,000 to recipients.